ROUND 16 was an intriguing one in the West Australian Football League (WAFL) Colts, as it saw a number of games between the elite teams of the competition and those who were looking to make major claims to play finals footy. The top teams were certainly tested this weekend but were there any upsets? Read on to find out. It may not have looked all that pretty on the scoreboard, but South Fremantle will not care one bit, as they claimed a thrilling four-point win over an extremely inaccurate Peel Thunder at Bendigo Bank Stadium in a result which could prove pivotal for both teams come the end of the home and away season. Heading into this contest, the Bulldogs led the chasing pack clamouring for the last finals spot and kept Peel goalless in the opening quarter, leading by eight points through a lone goal to Luke Moore. The dour, scrappy nature of the contest continued in the second term but this time it was Peel in the ascendancy kicking 3.7 to two behinds and opening up a very handy 15 point lead at the long break. South Fremantle, who have found some momentum in the past six weeks and pushed ladder-leader Subiaco in similarly wintry conditions last week, took back the momentum with goals to Matthew Ward and bottom-ager Alec Petkovic but they still trailed by five points with a quarter to play. While Peel were getting the ball into their forward 50, conversion was a major issue throughout the opening three quarters and that continued in the final 25 minutes. They could only manage six straight behinds while South Fremantle put the ball between the big posts on two occasions courtesy of Lachlan Johnson and Braiden Quartermaine. Accuracy was the main point of difference between the two teams as South Fremantle registered their sixth and most important win of the season while for Peel it was a wasted opportunity to put some pressure on top of the table Subiaco who had the bye. Ward illustrated the effort required to win a big game as he produced 27 disposals, eight tackles, three marks and a goal for the Bulldogs. He was well supported by Tom Blechynden who had 12 tackles to go with his 21 disposals. Meanwhile for Peel, Lachlan Riley was tireless with 29 disposals and five tackles and the work rate of Jake Howes was elite with 12 tackles to go along with 18 disposals. West Perth gave their season a deal of life with a stirring 16-point upset win over Swan Districts at Joondalup Arena on Saturday, which saw them move up to sixth position and remain within a game of South Fremantle in fifth. The Falcons started the stronger, opening up a 14 point lead at quarter time and while Swans swung into gear in the second quarter by kicking four goals, the Falcons held sway in the second term and led by 13 points at the long break. The third quarter was well and truly in favour of the visitors as they kicked three goals to three behinds by West Perth and turned for home three points in front. With everything on the line and considering positions of both teams on the ladder, you would have assumed that Swan Districts would carry that momentum into the final term and record a comfortable victory. 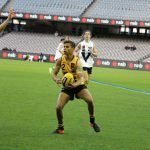 However West Perth had other ideas, as they kicked five goals to two with Western Australia Under 18 representative and Fremantle Dockers Next Generation academy prospect Thomas Medhat proving pivotal with two goals in the term. In truth, West Perth deserved their victory as they compiled 47 more disposals (290-243) and 12 more inside 50s (48-36) which led to six more scoring shots (21-15). With consistent ball magnet Nathan Murray promoted to the ranks of the reserves, it was left to others to fill that big breach and that was led by bottom ager Tyron Hindmarsh who had 28 disposals, five marks and four tackles. He was supported by fellow junior Jaxon Prior who had 26 disposals and seven marks while Medhat had 11 disposals and three marks to go along with three goals. Just like Peel, we may have to wait to the end of the season to see how costly this slip-up is for the premiership chances of Swan Districts but it is their fourth defeat in their last five games and are now a game behind East Fremantle in third. Bottom-ager Kade Walldrot continued his promising season for Swans with 19 disposals nine tackles, five tackles along with a goal while Benjamin Taylor kicked three majors along with six marks. East Fremantle overcame a stern test of their premiership credentials by defeating a gallant Perth by 12 points at Lathlain Park. Perth, who had been on a wretched run of form had over the past two months had the look of a confident side early in this contest and that translated to the scoreboard as they opened up a twenty point lead early in the second quarter. The Sharks were certainly getting their hands on the ball and creating goalscoring opportunities, however inaccuracy was their main issue kicking 2.8 for the half and trailing by 18 points at half-time. You have to go back to the last weekend of May where Perth recorded their last win but with the way they played in the opening two quarters, they headed into the second half with a strong belief that they could end their six-game losing streak. However, the Sharks know what it takes to win the big moments in games and the reigning premiers rolled up their sleeves and got to work in the third term by kicking four goals to two and narrowed the gap to three points with a quarter to go. Now they had a sniff, it was big trouble for Perth as Dylan Curley kicked a goal and that was soon followed by a second major to bottom-ager Ben Wardle and the game was now on East Fremantle’s terms. Despite Ian Hill kicking his third of the game soon after, East Fremantle steadied again and secured their fourth win and move into outright third on the ladder and only percentage behind second placed Peel. Curley was a strong focal point for the Sharks with five marks, three tackles and eight hitouts to go along with his 3.2, while Max Murphy was tidy with 20 disposals, six marks and a goal.Hill did all he could within his power to get the Demons over the line amassing 25 disposals, six marks and a goal while Sydney Stack was tireless with 26 disposals and 12 tackles. Claremont gave their finals chances a boost with a polished 45 point win over East Perth at Claremont Oval. Claremont got off to a very quick start in this important clash for both sides kicking the first two goals of the game and repeatedly driving the ball into their forward 50. However East Perth were able to respond with three consecutive goals, with Thomas Baulch kicking two of his own. The match was a very open affair as the Royals took in a four point lead to the quarter time break. 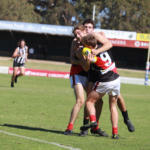 Claremont regained their early momentum in the second quarter kicking four goals to one and opening up a 22 point lead. Claremont arguably had their best first half of the season and led by 30 points at the long break having 44 more disposals (142-98) and 20 more inside 50s (30-10). The Royals, who came into this clash in good form having won their last three games managed to get their hands on the ball and therefore some momentum in the third quarter and kicked two goals to one with Ashley Willcocks kicking his third for the game. However, the Tigers still had a significant buffer heading into the final quarter and after letting many opportunity slip through their grasp this season, this game was not going to be another one of those occasions as they ended their three-game losing streak by kicking three goals to one behind to complete a 45-point win in one of their best performances of the season. It has been a season of frustration for last year’s runners-up but this win gives them a base to build upon and if they are able to qualify for the top five, they will certainly be a difficult opponent to face for the rest of the finalists. The Tigers controlled the tempo from the very start of the contest and ended up with 62 more possessions (292-230) which led to 28 more inside 50s (57-29) and 15 more scoring shots (25-10). 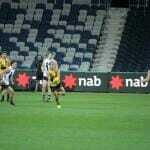 Two top-age talents led the way for the Tigers with Corey Hitchcock kicking four goals while Isaac Barton was a nuisance to the opposition with 12 tackles along with 18 disposals and two goals. The performance of Zainel Bin Busu was also a key factor for the Tigers’ win as he had 18 disposals, nine tackles and two goals. It was tougher to find influential players for the Royals, but Baulch once again led from the front with 25 disposals, nine marks four tackles and a goal whileWillcocks made the most of his opportunities with three goals. With the loss, the Royals fall to the bottom of the ladder, but such is the topsy-turvy nature of this unpredictable season, they sit just one game out of the top five with a game in hand over their rivals, although their percentage is the poorest in the league at just 73.9. Swan Districts are still a game clear on top of the ladder after Round 9 of the West Australian Football League (WAFL) Colts season in a round where two local derbies took place. The Black and Whites were too strong for fellow top four contender Perth, as they registered a comfortable 13.6 (84) to 6.4 (40) win at Bassendean Oval. The Swans led at every break and were never challenged, led by Denver Grainger-Barrass who claimed best afield honours in his team. Ruckman Blake Rowlinson was also among the best with a solid 26 hit outs, while Riley Garcia was prolific with 28 disposals. For the Demons, livewire Blake Little toiled all day and was named as best, while Sydney Stack (19 disposals) and Zac Casey (23 disposals, seven tackles) worked all day in the midfield, collecting impressive numbers. Claremont have continued their underwhelming start to the season after falling away against Peel Thunder at Claremont Oval, losing 7.8 (50) to 12.14 (86). The Tigers, who have made the past four straight WAFL Colts grand finals are languishing in second last on the ladder at the halfway mark of the season. For the Thunder though, impressive performances from Jye Kimptom, Bailey Taylor and Lachlan Riley (20 disposals) helped give them the late ascendency. Oliver Henderson was named the Tigers’ best, while Lachlan Southern and Max Grant (20 disposals) were strong contributors, as the Tigers face a tough ask ahead against the Swan Districts in Round 10. In the Perth Derby, an inaccurate West Perth cost themselves a chance to leap into the top five, after losing to East Perth 3.15 (33) to 6.10 (46) at Arena Joondalup. The Royals, who are still at the foot of the ladder, nabbed their second win of the season, led by Yugusuk Soka, who was named best with 16 disposals and three marks, while defender Jordan Hayden and midfielder Jarrod Hamer-Mathew (22 disposals and two goals) also put in impressive performances. For the Falcons, Jamie Dowen (12 disposals, four tackles) was named as the best player, while Alec Johnson (23 disposals) and Jaxon Prior (21 disposals) were consistent all day. While in the Fremantle Derby, East Fremantle nabbed a victory over cross town rivals South Fremantle, wining 10.8 (68) to 8.6 (54) at Fremantle Oval. Down by two goals at the main break, the Sharks rallied to kick seven goals to three in the second half to storm home with a win. Led by Jake Diggle and Tom Wright (11 disposals, 10 tackles), the South’s could not find an answer to the second half onslaught. Impressing for the Bulldogs was Manfred Kelly with a 17 disposals, four tackle game, while ruckman Benjamin Pears (27 hitouts) and Toby McQuilkan (18 disposals) toiled hard all day.